Let’s face it, websites are prone to being hacked. Hackers usually target vulnerable website that have outdated plugins/scripts, nulled plugins/scripts, and custom plugins/scripts. When they find out that your website has a vulnerability, they will simply take over your website and use it for their means. If you run a serious company the above scenario could be detrimental to your business and possibly your relationship with your current web host. Web hosts have the right to shut you down if there is potential damage to other customers that are hosted on that same server as your infected website. Therefore, your website simply gets shut down and you are told by your web host to fix the problem. Web hosts are not responsible if an individual website is compromised, and the rest of the server was not. If you are not tech savvy this could turn into a huge problem. Now you have to find someone to fix your problem and yet your website is down. Your customers/visitors could notice the downtime and loose interest into gaining and products or services you may offer. Google spider/bot that visits your website to harvest information will notice that the website is down and could potentially downgrade your website rating in their search index hierarchy. We a package with a fixed monthly fee. Fixed Monthly fee is great for those companies with a specific annual budget that don’t want any additional costs involved if their website something goes wrong. The monthly package is for clients who don’t know how to fix problems on their own, or don’t have to do a WordPress / Plugin update in fear that it may break the website. 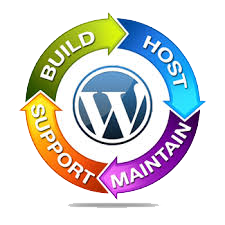 Why not have a peace of mind and subscribe to our monthly nominal priced service which will cover you for any future WordPress / Plugins issues. NOTE: This package is for 1 WordPress installation. The package is for maintenance only (updating existing WordPress software). If you are looking to ramp up your security or if you are website has been hacked, we offer services for both that are separate from this one.